Imagine having a device which can post sound bites from your home to your Facebook wall. Now and then it will record the sounds in your home, scramble them – so listeners cannot recognize specific sounds, and it will make an audio post for you. Most people I talk to, think this is a stupid idea. But it is what “Facebook Listener”, designed by Stefan Veen and his colleagues, does – and I do believe it could be a success. Or at least I believe in the broader idea of awareness systems: allowing people to share background information with others in a lightweight way. In this post I will answer four critical questions I often get about awareness systems and I hope to show where the opportunities for awareness are. Maybe I should to take a step back and discuss shortly where some of the ideas behind Facebook Listener originated. The academic tradition of awareness systems started in the workplace of the early 1990ies. When people collaborate they build on tacit knowledge about each other. Several workplace studies showed that people who have an awareness of their co-workers can collaborate more easily and effectively. Scientist turned out to publish most articles with people whose office was nearby. People in control rooms needed details about what others were doing to avoid mistakes. Because of findings like this, researchers slowly started to recognize a design opportunity: “If people need background information about each other to work together”, they thought, “can’t we design systems which deliver such information across a distance?”. So soon, researchers started to build devices which allowed awareness, background contact and casual communication at a distance. Mostly these media spaces, as they were called, involved video links between multiple remote offices. This was exciting and controversial work: in those times computers had to be useful tools to complete specific tasks effectively. The idea to use computers to provide background information about others seemed to come from outer space. Exciting or not, researchers needed several incarnations to get the design of these systems right, and honestly, the early controversy didn’t fade. 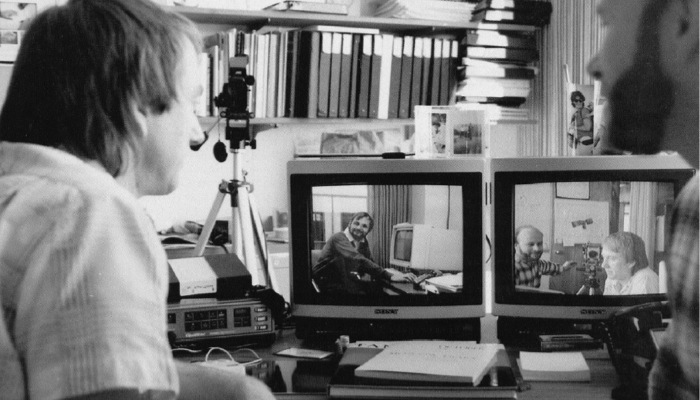 Early awareness systems, called media spaces, provided video links with remote colleagues. Is there a need for awareness systems? The top 1 question. Does your work, for example, improve if you get a video connection with remote colleagues; so you can see them behind their desk, typing? Or, does anyone benefit from listening to scrambled sounds from your home on Facebook? Perhaps not: I have not seen studies of media spaces which led to measurable improvements on business results and clearly my friends survive without being able to listen to my house sounds today. But, probably yes too. Consider Digital Family Portrait, for example. Researchers from Georgia Institute for Technology placed sensors in the home of an elderly woman so the computer system could get a sense of her activity during the day. The (adult) children could see this activity data on a digital photo frame in their home. There were butterflies around the picture of the elderly woman and big butterflies meant “mother is active”, while little butterflies pointed to the opposite. Digital Family Portrait raises many questions, but the users were positive about it and it shows how awareness systems can support real communication needs. Digital Family Portrait gives subtle cues about activity. Often, our communication is not so much about the contents of the communication but for the sake of communicating itself. This is called phatic communication. When I share what I am eating on Twitter, my followers learn something boring and something important about me. The boring part is what I am eating. The important part is that I am alive, all is well, and the communication channel is open. They can contact me if they want to. It turns out that this last phatic part of the message is important, in particular between close ones. The users of digital family portrait didn’t really need to know how active their grandmother was. But they needed a possibility to check on her regularly for their peace of mind. Digital Family Portrait provided them an easy way to do just that. There are other reasons the butterflies on Digital Family Portrait made good sense as well. The meaning of a bit of information about someone close to you depends on your background. To the users of the Family Portrait the size of the butterfly is not so important, but the way it changes over time is. A sudden drop in activity, for example, means there is a reason to check on grandma (or the hardware). Finally, background information such as Facebook Listener, Media Spaces or Digital Family Portrait give, can be a starting point for a more intimate and meaningful conversation. Users of Digital Family Portrait could use the butterflies to talk about health and lifestyle choices. So it could be that Facebook Listener, Digital Family Portrait and Media Spaces aren’t presenting the right information about the right people in the right way, to the right people. But this doesn’t mean the general idea is wrong. It seems people want to share and receive background information about others. Even if it is just phatic communication, I would say there is a need for awareness systems. Why spyness systems? What is wrong with human updates? Aren’t those sufficient? Granted that people need background information from others and that they already share such information on social media, why bother any further? Or stronger: aren’t we crossing a hard and scary border when we start to capture and send information about people automatically, like the three examples so far do? I find this question much more difficult to answer, but I would say no: it fine to build systems which give automatic updates. Perhaps JK Rowling can support my argument. In the Harry Potter book “The Goblet of Fire”, the Weasley Family has a clock which shows were family members are, rather than the time. This is an example of automatic updates that seem sympathetic and useful. In fact we know from research it is. Soon, this “whereabouts clock” as researchers called it, was build and evaluated by Microsoft Research . They report that – at least within nuclear families – the clock gave a sense of reassurance, connectedness, expression of identity and social touch. The clock quickly became an integral part of the routines of the family members: it provided phatic communication possibilities. Family members got a sense that everything was going to routine, that all was well. Part of the success of the clock may have been its Potterish design, though. Much like the original version of the Weasley family, and unlike some commercial tracking systems, Microsoft’s whereabouts clock used rough place labels like ‘home’, ‘work’, ‘school’ and ‘elsewhere’, rather than precise GPS data. Probably there is a tradeoff in automatic sharing. The more intimate the data you share gets, the more abstract, course grained or fussy the presentation of this date needs to be, to be acceptable to users. Figure 4: Microsoft incarnation of the whereabouts clock, first described in an Harry Potter book. Who needs even more ‘information display’s’? This question comes in different forms, but the gist is that people wonder how to act on the new information they are getting. Wouldn’t it be awkward to pick up the phone and say “why’s your butterfly so small today ma”? The notion of awareness is information centric much more than communication centric indeed. Many awareness systems researchers want to figure out what people could share though sensors and how to show this information to users. They seem to care less about the next step: providing the means for the ‘talk’ that may follow from the awareness. Often, like in Digital Family Portrait the information stream is one directional too. The mother lacks common ground, she doesn’t know how big her butterfly is that day, which creates the awkwardness of the example. Some researchers argue that people have enough channels and the awareness system only needs to provide the ‘trigger’ for the communication. But I think the evidence from the studies I mentioned points in a different direction. 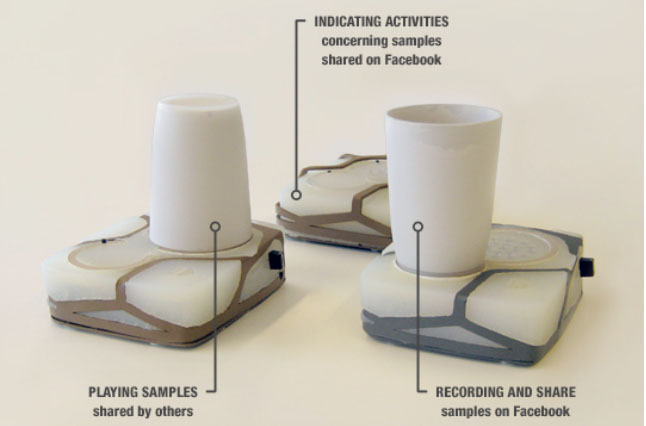 Users of Facebook Listener turned out to use it to create dedicated ambient-home-sound-scape messages for their friends. Microsoft researchers reported that users of the whereabouts clock wanted to be able to send messages back to their peers from the clock. Evaluators of other awareness systems report similar findings. Awareness information triggers communication needs, and it seems normal to support those from the system, preferably in an open ended and playful way. Who would buy such a system? This is a fair question. A positive evaluation doesn’t form a business case. There are two serious barriers to market entry of current awareness systems: single purpose systems and the network effect. Many awareness systems serve a single purpose: a specific awareness need or a single type of awareness information. This fine for research projects, but it creates small markets and high entry costs. It seems difficult to overcome. 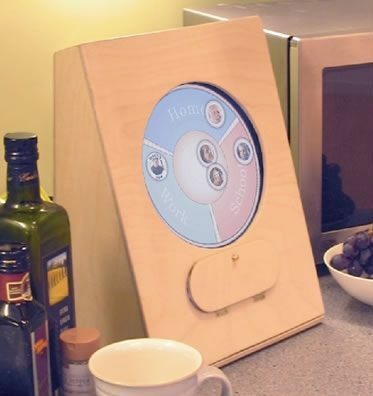 Users of the Digital Family Portrait and the whereabouts clock can understand the information of the system because the design supports the use case. Some have tried to create more flexible awareness systems such as the modestly successful awareness rabbit called Nabaztag, but this is difficult. It is a pity, but Nabaztag cannot display location information of the family in an optimal way. When we abstract away from (design for) a specific type of information the awarness display becomes hard to read. A related problem is the network effect: part of the value of any communication system is in the number of users that already use it. Awareness systems, usually being specific purpose, a-symmetrical and standalone, may suffer from this effect. The decision to buy or use is not with a single person but at least with a small group. This makes those awareness systems that make use of existing technical infrastructure and use patterns (of mobile phones for example) much more likely to succeed than other sensible awareness proposals. Nabaztag is a general purpose awareness systems. 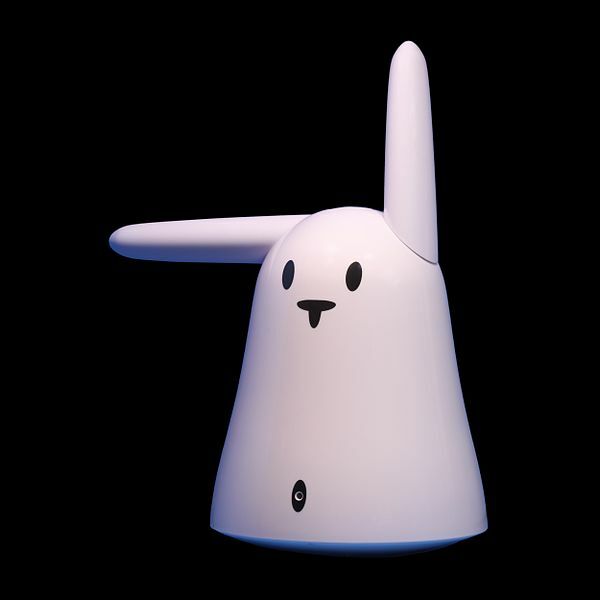 The ears can be used to communicate with other Nabaztag users. So the proposal of Stefan Veen and his colleagues: to make awareness systems which cooperate with Facebook makes a lot of sense from a market perspective. The idea is resembles our proposal of a year earlier: to integrate social media and business by building software on top of the existing social media (integration software). The benefit could be that users are already networked in this environment and they can make use of its lightweight communication tools. But this benefit comes with two costs. First, there is a usability challenge. In our own research we found that it is hard to communicate to users how the use of the new interface works together with Facebook. In a way users handle two systems at the same time. It is not easy to understand how an action in the integration software or awareness system plug-in changes the state of Facebook, for example their timeline. Second, Facebook integration only has an advantage if whatever comes out of the awareness system is also informative for non-users of the system. Any message the new system puts on Facebook needs to be a good addition to the facebook timeline. This is a strong limitation. So while I expect that awareness systems will be build that will integrate with social networking sites, chances are that they will most likely provide a new output of the data which is on Facebook already, or can be inferred from it, rather than providing a new input device. But on the other hand, if awareness systems are eventually communication systems new inputs will soon be added to this outlet in your home. Much of the information for this blog post comes from the book “Awareness Systems: Advances in Theory, Methodology and Design”. In particular: the history of awareness (chapter 1), phatic communication (chapter 7) and the wheraboutsclock (chapter 18). The design of Facebook Listener is described in detail in this NordiChi paper, the Digital Family Portrait in this paper. Our exploration of software which uses social media as an infrastructure for new applications can be found here. Loosley related to this post are my post about common ground, privacy coordination, playification and Twitter. Several incarnations where build at Eindhoven University of Technology as well. I wonder what role awareness systems play in a world wich seems to me to be overwhelmed by sensory data already. I guess awareness can come subtly from the ambience of our surroundings, but what if our ambient surroundings become increasingly saturated with potential information? Does this mean awareness systems only have their place in personal space, or will they be allowed to persist (and compete with eachother) in public environments? While writing this I thought maybe this sounds a bit too much like a grumpy old man weary of ye good ol’ times. But then I look up from my seat in the train, and notice that -without exception- every single passenger is staring at a display of some sort, absorbing information. Whatever it brings, I hope the future also comes with a button to mute all awareness, every once in a while. As most of the systems I discussed in my post are about interpersonal awareness in small groups, it doesn’t seem likely they will appear in public space. But your comment is no less valid for the home environment, which is invaded by screens too. The standard answer to this object is to radically change information design. In chapter 4 of the awareness systems book which I mention in my post, Koert van Mensvoort argues that nature itself is full of information – at least for those who try to survive in it, still we do talk about the information overload of the woods. Can’t we design our electronic information in such a way it supports us rather than bothers us? Proponents of his view explore the design of calm technology, ambient information displays or peripheral displays and I might dedicate a post to this work sometime in the future. So far I found the calm proposals somewhat impractical, and proposed to conceptualize it differently. My proposal is to think of this issue in terms of experience blend. Designers should develop thinking tools to reason about how new user experiences can blend into old ones. This idea borrows a lot of concepts from the calm technology people, but it les conceptual. In all, I believe there is room for some awareness if the information is delivered in the environment rather than this narrow channel the smartphone.